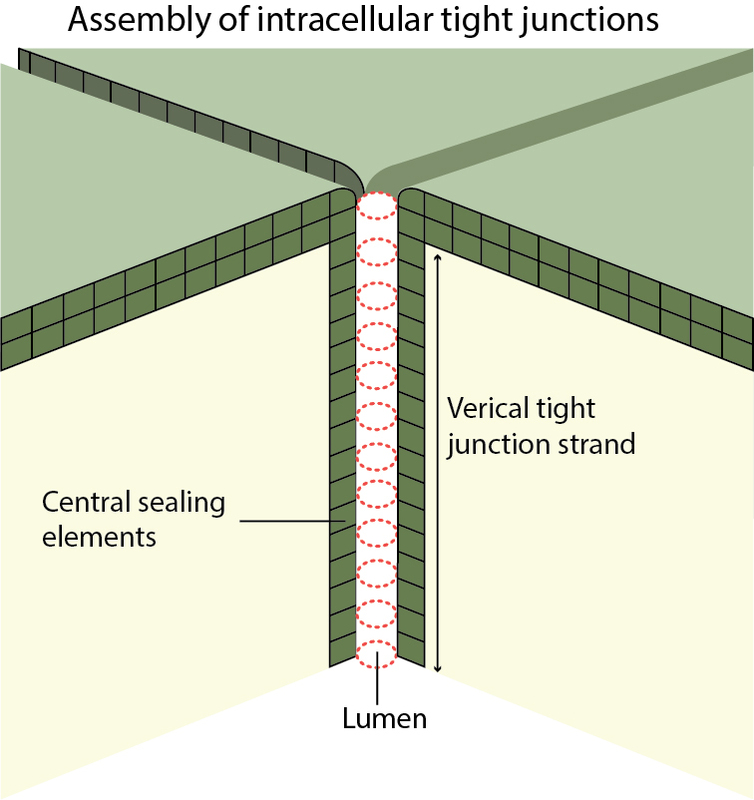 How are tight junctions assembled? The epithelial tissue is held intact by the formation of tight junctions between cells. The basic functional units that form adhesive contacts across cells are the tight junction strands, which are composed of transmembrane proteins such as claudin, occludin and tricellulin. The assembly of the strands requires their association with a cytoplasmic plaque of adaptor proteins such as the ZO proteins, which link them to several regulatory and signaling molecules and to the cortical cytoskeleton. Coordinated interactions amongst the molecular core regulates tight junction assembly by ensuring proper localization of tight junction components and by stabilizing the junctional complex. Bicellular tight junctions, found between the lateral membrane surfaces of two adjacent cells, are primarily formed by claudin strands. A model for claudin assembly into tight junction strands has been recently proposed from the crystal structures of mouse claudin-15 . The formation of linear claudin polymers in initiated by intermolecular interactions between adjacent claudin monomers through residues on their extracellular loops. A conserved hydrophobic residue on the extracellular helix (the segment connecting the beta-4 strand to transmembrane segment-2) of one monomer docks at the hydrophobic pocket formed by conserved residues in transmembrane segment 3 and extracellular segment 2 of a second monomer. The two contact surfaces are on the opposite ends of the two monomers and facilitate chain-like association of other monomers at newly-formed ends, resulting in a linear polymer. Higher order assemblies occur by the association of two linear polymers, resulting in an antiparallel double row. Claudin molecules in the two chains interact with each other via their extracellular palms (beta-sheet structures). This side-by-side association is stabilized by the formation of hydrogen bonds and leads to the formation of a ‘half-pipe’-shaped continuous beta-sheet structure across the double row. The final step in tight junction formation involves the association of two claudin double rows on adjacent membranes, leading to the formation of the paracellular channel pores. This is mediated by the two variable regions (V1 and V2) lying within the extracellular segments that form flexible loops with poorly conserved residues. The variable regions are found at the two ends of the ‘half-pipe’, and are known to change conformations to fit into variable regions of claudin molecules on adjacent cells. The joining of two ‘half-pipe’ claudin rows results in a closed beta-sheet channel, with a pore size of less than 10 Angstroms . Tight junctions are organized into specialized structures at tricellular contact sites, where the vertices of three cells meet, and they are referred to as tricellular tight junctions. Seminal studies in the 1970s on the ultrastructure of tricellular tight junctions revealed a model for their organization, which remains unchallenged till date . This model describes tight junctions as long and narrow tubes that lie perpendicular to the plane of the epithelial cell layer. The apical strands formed at the three pairs of bicellular tight junctions spread to the center of the tricellular contact, from where they turn inward and extend basolaterally. Three pairs of such vertical strands, also referred to as central sealing elements, associate laterally and organize into a tubular core . The dimensions of these central tubes (approx. 1 µm in length and 10 nm in diameter) restrict the free diffusion of solutes, and this contributes to the paracellular epithelial barrier. Tricellular tight junctions assemble as long, narrow tubes at the vertices between the three cells. Although the vertical strands at tricellular contacts are formed as extensions of bicellular tight junctions, they are formed by proteins other than claudins. 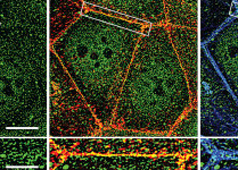 By using immunofluorescence and freeze-fracture imaging techniques, tricellulin, a MARVEL family transmembrane protein, was shown to be uniquely concentrated at the central sealing elements of the tricellular tight junctions . Knockdown of tricellulin resulted in discontinuous tight junction strands, and gaps at tricellular contacts . Functionally, this suppression of tricellulin compromised epithelial barrier integrity by decreasing transepithelial electrical resistance and increasing paracellular flux . Though the transmembrane protein strands form the architectural framework of tight junctions, the assembly and homeostasis of the junctions is inevitably reliant on the various regulators of the process, such as cytoplasmic adaptors, signaling molecules and cytoskeletal structures. What is the role of the cytoskeleton in the regulation of cell-cell adhesions?